San Jose Sharks general manager Doug Wilson rarely has failed to be bold while trying to deliver a Stanley Cup. He built the core of a Cup contender around Joe Thornton, Patrick Marleau and Dan Boyle, and has continued in recent seasons to search for the final, elusive piece to earn the Sharks a title. Wilson brought in Martin Havlat and Brent Burns last summer, but Havlat missed much of the season because of injury and the Sharks had an atypically tough time qualifying for the Stanley Cup Playoffs before losing to the St. Louis Blues in the first round. The Sharks had 96 points -- their worst regular season in eight years. This offseason Wilson traded for the rights to Brad Stuart and quickly signed him to a contract. The move bolstered what might be the League’s deepest defense corps (and subsequently weakened one of the other top contenders in the Western Conference). 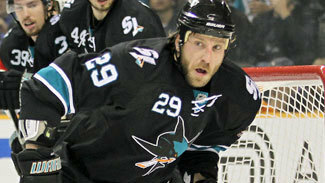 Under-valued: Ryane Clowe – Points dipped from 62 to 45 last season, but he could certainly return to 2010-11 level this year. One of the few 50-plus point and 100-plus PIM potential players out there, Clowe won’t hurt owners in any category and is likely a steal on draft day. Over-valued: Joe Thornton – Sure he had 77 points last season, but PIMs decreased for a fourth straight season, PP production has decreased in five of last six seasons and the shot total maxes out around 150. The assists and solid plus/minus should always be there, but he’s not getting any younger and is no longer an elite fantasy asset. Sleeper: Martin Havlat – Despite the household name, Havlat might slip in drafts because he only appeared in 39 games last year (seven goals, 27 points), but he’ll be a top-six forward and has the talent to put up point-per-game numbers when he’s healthy -- draft him in middle-to-late rounds and you might have a steal. Adam Burish was brought in as a depth forward, but Stuart was the marquee addition. In fact, he is to this point in the offseason the biggest veteran acquisition by any of the eight teams that qualified for the playoffs in the Western Conference in 2011-12. With Stuart and better health for Havlat and Michal Handzus, the Sharks should again be near the top of the Pacific Division and the Western Conference standings. They again will be one of the top contenders for the Stanley Cup, with only their postseason record in this era (and maybe lack of faith in the goaltending) as reasons why pundits might be gun shy about being bullish on the Sharks’ chances. NOTES: There aren’t many better top-six forwards in the League on paper, but San Jose's stars need to stay healthy because depth is not a strength for this club. Marleau and Clowe saw their production slip last season, and Thornton has been below a point per game for two straight seasons. The Sharks have seven defensemen who probably could log top-four minutes, and for some pretty good teams. Braun and Demers still are pretty young, so don’t expect one to sit for very long -- they could be rotated when everyone is healthy. San Jose will be one of few teams that won’t be hurt significantly by an injury or two at the position. Niemi’s final totals were pretty close to his two previous seasons, and he was better in the 2012 playoffs than he was in 2011 when his team lost in the conference finals. He has also proven he can help, if not lead, a talent-rich club to the Stanley Cup. Still, there will be some pressure on him to be better, including possibly more starts for Greiss if needed.